Innobaby's Award Winning Teethin' SMART Massaging Flower Rattle Teether offers an easy-to-grip handle and lightweight design for even the youngest teethers. The unique dual sided shape and textured petals offer gentle relief for swollen, sore, and tender gums. The soft and flexible design reaches all parts of the mouth for a thorough and gentle gum massage, while stimulating oral sensory nerves for improved speech and oral development. Created to be safe for your baby, our teether is designed with ventilated breathing holes for safety while the baby chews. Innobaby's Teethin' SMART Massaging Teethers are a safe, toxic-free way to help babies satisfy their teething needs. BPA free, Phthalate free, and PVC free. Research shows improving oral motor skills aids effective nursing, develops proper muscles for eating solids and drinking liquids with a cup, and improves speech. Top shelf dishwasher and freezer safe. Innobaby’s Flower Teethers allows for multiple sensory stimulation. Give baby a pair of rattles to increase bilateral movement and stimulate both sides of the brain. The different textures will also improve oral motors skills by stimulating tongue, lip, and cheek muscles, which aid in nursing, transitioning to solid foods, drinking from cups, and speech development. As always, Innobaby’s teethers are held to the highest standards in safety (Toy Safety Standards ASTM F963 and EN71). 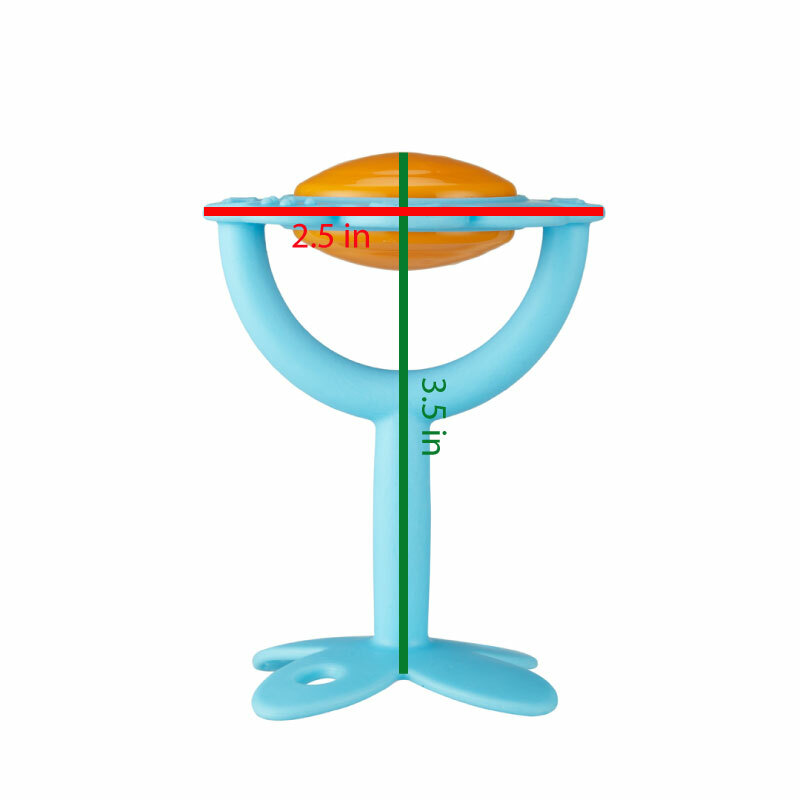 100% SAFE FOR YOUR CHILD - The ORIGINAL Innobaby Flower Rattle Teethers are safe and toxin free. Made of the highest quality TPE in South Korea that will not break or crumble. Our products are BPA free, Phthalate free, PVC free and Lead Free. PROVIDES RELIEF FOR SORE GUMS - This teether features a sleek, easy to grip handle and a variety of stimulating textures to ease that pain. The unique petal and leaf design allows for reaching all parts of the mouth, even those difficult molars. STIMULATES DEVELOPMENT OF MOUTH AND HAND-EYE COORDINATION - Our innovative design and different textures will help improve oral motors skills by stimulating tongue, lip, and cheek muscles, which aid in nursing, transitioning to solid foods, drinking from cups, and speech development. AWARD WINNING- The Original Innobaby Flower Rattle teether has won numerous awards including: The National Parenting Center's Seal of Approval, Best of April Box by Citrus Lane, Best in NY Baby Show, and NY NOW best in baby gear. HIGHEST QUALITY STANDARDS - Our teethers meet the highest quality standards in the baby products industry. All our teething products adhere to ASTM F963 -11 and CPSIA standards. Plus, they are easy to clean and freezer safe (perfect for cooling and soothing relief). I've used this teether for my own son, and I always buy one for my friends with new little ones. It's easy for little hands to grasp and it reaches even those pesky back molars. Plus sometimes they just like something to hold, and this is perfect! We love this teething toy! Not only does it provide teething relief to our little one, but it helps her to develop oral motor skills and also just fun to play with. It is easy for my daughter to hold and maneuver and she loves making it rattle! Great quality and super cute! This is my babys favorite teether. Its material is super soft and the skinny handle allows him to use it independently!! This is a fantastic teether. I was gifted one for my second baby and wished I had had it for my first. It has survived several household moves across the states and an international move. My 3rd baby would only use this teether and it is washed, sanitized, and ready to go for baby number 4! My little one absolutely loves this teether! Its so fun! Great for small hands and super easy to clean! Perfect toy for tiny hands! I found this rattle on their website not even looking for one! I’ve actually been looking for a soft rattle for my 4 month old for a while now and have not been able to find one that seemed safe enough! This rattle is perfect! It’s super lightweight and easy for her to grab! Its great for teething too! She pops it right into her mouth! The bottom “petals” have raised lines perfect for teething, it also has a spot to attach a pacifier clip so it doesn’t stray! Great teether! It is high quality and the material is soft and great for chewing. I love the bright colors and cute flower design. This is also not only a teether, but also a rattle and can be moved and twisted around - so many uses and fun for baby! My daughter loved playing with this and it helped relieve her teething discomfort. I love that I can freeze this and also throw it in the dishwasher. I received this for free, but all opinions are my own. This is a perfect item for a baby registry. This is the first teether my 4 month old took to and she is able to grasp it with her little hands helping her establish independence . It's very flexible and also doubles as a rattle so it keeps her entertained for a while. My toddler also loves it because it has a nice texture to reach her molars that are cutting through. I would definitely recommend this product! I ordered this for my niece to try. She is only a few weeks old right now. I opened the package to see the teether and loved the butterly and flower design right away. I love the fact this is light weight and flexible. I am sure she will love this!! My 8 month old just started teething and this is one of his favorite things to "chew" on. Its easy for him to pick up and the little rattle makes it fun for him.